Symes, Sally Whose Toes are Those? Illustrated by Nick Sharratt Candlewick Press, 2012. $7.99 BOARD BOOK Content: G.
This is a lift the flap book that hides different animals behind the flap and then asks questions about the body parts that are showing to give the reader a hint as to what is hiding. 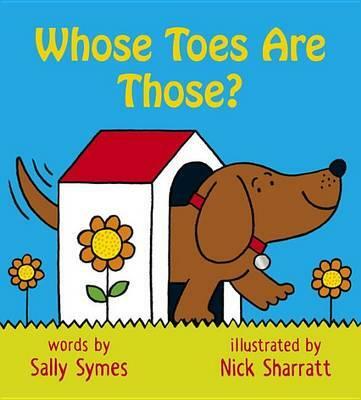 For example, the first page shows a mouse’s tail, foot and nose and the pages reads: “Whose tail? Whose toes? Whose twitchy nose?” and when the reader lifts the flap there is a picture labeled: “mouse”. There are five different pages in the book: a mouse, dog, hippo, bear and a baby. The book has bright illustrations and the flap is large enough that small hands can flip it themselves. Also the large flap is sturdily attached to the book. There are three questions per animal. This is a great book for little kids who like to interact with their books. PRE-K - ADVISABLE. Reviewer, C. Peterson.